A federal judge dismissed complaints in a lawsuit alleging former Justice Department officials violated the rights of Arab or Muslim immigrants in the immediate months after the September 11th terrorist attacks. The lawsuit, brought by the Center for Constitutional Rights, sought to hold the officials accountable for subjecting the immigrants to harsh confinement on the basis of their race, national origin and religion. Still, the judge allowed claims of violations against prison staff to proceed. 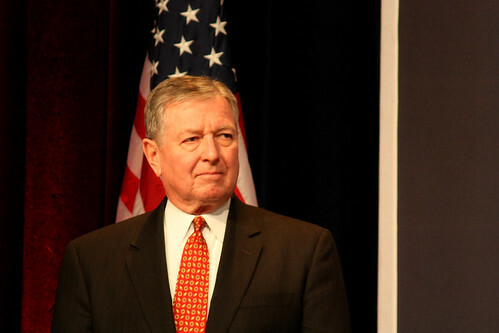 Judge John Gleeson of the US District Court of the Eastern District of New York ruled the allegation that former Attorney General John Ashcroft, FBI Director Robert Mueller and Metropolitan Detention Center (MDC) or the Passaic County Jail and former Commissioner of the Immigration and Naturalization Service James W. Ziglar created the harsh confinement policy that led to the rights violations. However, the judge found no evidence of any intent to punish. The judge also failed to find any evidence that the officials intended that MDC or Passaic staff impose harsh conditions or that they were aware the prison staff was keeping the men in such conditions. With respect to violations of equal protection under the law, the judge determined there were “ample allegations that these defendants” had classified persons on the “basis of race, religion and national origin for purposes of arrest and detention” but that did not “constitute equal protection violations standing alone.” Ashcroft may have directed all “male immigration violators between the ages of 18 and 40 from a Middle Eastern country did not, in light of the executive branch’s plenary power over immigration, amount to an equal protection violation.” And even though Ashcroft, Mueller and Ziglar knew law enforcement did not have any information tying the men to terrorism and a few individuals detained who were not Arab or Muslim were “cleared quickly or moved in the general population without clearance,” the men still did not have a valid claim to pursue accountability. But the judge allowed claims against Dennis Hasty, former Warden of the Metropolitan Detention Center (MDC), Michael Zenk, former Warden MDC, James sherman, former MDC Associate Warden for Custody; Salvatore Lopresti, former MDC Captain and Joseph Cuciti, former MDC Lieutenant to proceed. Claims based on alleged harsh conditions of confinement and unlawful strip searches and that the officers had engaged in a conspiracy to violate the rights of detainees were deemed to be valid. …[F]or over 23 hours a day, provided with meager and barely edible food, and prohibited from moving around the unit, using the telephone freely, using the commissary, accessing MDC handbooks (which explained how to file complaints about mistreatment), and keeping any property, including personal hygiene items like toilet paper and soap, in their cells. Whenever they left their cells, they were handcuffed and shackled. Although they were offered the nominal opportunity to visit the recreation area outside of their cells several times a week, the recreation area was exposed to the elements and the MDC Detainees were not offered clothing beyond their standard cotton prison garb and a light jacket. Furthermore, detainees who accepted such offers were often physically abused along the way, and were sometimes left for hours in the cold recreation cell, over their protests, as a form of punishment. As a result, they were constructively denied exercise during the fall and winter…. Prison staff at the MDC subjected detainees to sleep deprivation. The judge’s ruling further described how the detainees were subjected to “frequent physical and verbal abuse” that included “slamming the MDC Detainees into walls; bending or twisting their arms, hands, wrists, and fingers; lifting them off the ground by their arms; pulling on their arms and handcuffs; stepping on their leg restraints; restraining them with handcuffs and/or shackles even while in their cells; and handling them in other rough and inappropriate ways.” It was unnecessary, according to the judge. The detainees were “always fully compliant with orders and rarely engaged in misconduct.” And they were referred to as “terrorists” and “other offensive names,” cursed at, threatened with violence, insulted for being Muslim and humiliated by sexual comments made during strip searches. The frequent strip searches the men were subjected to by MDC prison staff is particularly foul. At Passaic and MDC, the men were “strip-searched every time they were removed from or returned to their cells, including before and after visiting with their attorneys, receiving medical care, using the recreation area, attending a court hearing, and being transferred to another cell. “ Each time they arrived at the MDC “in the receiving and discharge area and again after they had been escorted – shackled and under continuous guard – to the ADMAX SHU,” they were strip-searched. …They were denied sufficient information to obtain legal counsel; although they were given a list of organizations that provide free legal services, the contact information for these organizations was outdated and inaccurate. Legal calls that resulted in a wrong number or busy signal were counted against their quota of calls, as were calls answered by voicemail. Officers frequently asked the MDC Detainees, “Are you okay?,” and if the MDC Detainees responded affirmatively, the officers construed this as a waiver of their already-limited privilege to make legal calls. The officers also often brought the phone to the MDC Detainees early in the morning before law offices opened for the day. And they frequently pretended to dial a requested number or deliberately dialed a wrong number and then claimed the line was dead or busy. They then refused to dial again, saying that the Detainee had exhausted his quota. The treatment was similar to how CIA interrogators treated detainees in black site prisons. And, again, there was no evidence to tie any of these men to terrorist acts of violence. Only mere suspicion existed. Purna Raj Bajracharya, a citizen from Nepal who was in Queens, New York, illegally, was detained after “an employee of the Queens County District Attorney’s Office reported to the FBI on October 25, 2001 that an ‘Arab male’ was videotaping a building that contained the District Attorney’s office.” He was preparing to return to Nepal and wanted to take some video of New York to show to his family. In late November 2001, FBI agent visited the ex-wife of Akhil Sachdeva at her gas station. The agent was looking for a “Muslim employee who had been overheard having a conversation in mixed Arabic and English relating to flight simulators and flying.” The FBI requested Sachdeva’s wife have him contact the FBI. In December, he called them and then came into the office. FBI agents questioned Sachdeva, an Indian citizen, about his involvement in the 9/11 attacks and his religious beliefs. The FBI examined his “personal identification” then let him leave. On December 20, 2001, INS arrested him at his uncle’s apartment. The decision by the judge is remarkable in two respects: (1) again, federal officials have escaped accountability for torture and abuse and (2) the judge is at least allowing some of the claims of violations to move forward and there is the potential that the men could win their case. Overall, the decision lets those who served in high-ranking positions off the hook (again). It does, however, leave open the possibility of some semblance of justice. The ruling does note the seven men are bringing this on behalf of others who were rounded up in a similar manner. What happened in the immediate aftermath to people who were completely innocent was appalling. Since courts have not been open to awarding damages for torture and abuse and have shown complete deference to national security interests since 9/11, that is something that should give the men a bit of hope.